Few people can say that they started cooking at the age of five, but Jessica Largey can race her culinary roots back to a popular breakfast dish. While watching her mom make scrambled eggs one morning, Largey took in every detail from preparation to cooking and decided to recreate the dish on her own the following morning. From that moment, she was interested in everything that went on in the kitchen. Growing up northwest of Los Angeles in Ventura County, surrounded by agriculture, she developed an appreciation for farming and sustainability alongside her love of cooking, ultimately leading her to work at regional farmers markets and visiting local farms. After attending the California School of culinary Arts in Pasadena, Largey began her career working for renowned chef Michael Cimarusti’s seafood-focused Providence in 2005. Following her time at Providence, Largey embarked upon a whirlwind culinary tour of Italy, followed by an internship at The Fat Duck, outside London. Upon her return stateside, she became opening chef for Silver Lake’s LAMILL Coffee Boutique, in partnership with Providence. She spent her last years in LA at Bastide , in West Hollywood, CA, under chef Paul Shoemaker. Manresa, the three-Michelin star restaurant in Los Gatos, CA, drew her up the coast in 2009. Attracted by not only the restaurant itself, Largey was very interested in its exclusive partnership with the biodynamic Love Apple Farms. 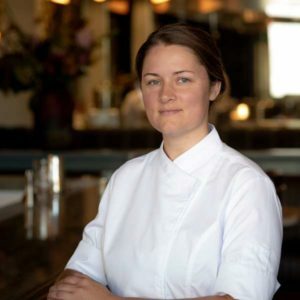 Largey rose to Chef de Cuisine within two years, and during her tenure at Manresa was named a Zagat “30 Under 30” for San Francisco, StarChefs.com’s “Rising Star Chefs,” and Eater’s “Young Guns” in 2013. In 2014 she was named a San Francisco Chronicle “Rising Star Chef” and was a finalist for “Rising Star Chef of the Year” at the James Beard Foundation Awards. In May 2015 she was awarded the James Beard Rising Star of the Year. Following a non-stop decade, Largey took some time off to travel—both domestically and internationally, returning to the kitchen eight months later to complete a guest chef residency at Intro in Chicago. Destiny has brought Largey back to her hometown. In partnership with film director Joe Russo and partner/general manager Bruno Bagbeni, the trio has created SIMONE, a timelessly designed restaurant in the emerging Arts District of Downtown LA. A departure from her fine dining pedigree, SIMONE will embody a spectrum of experiences for guests. The 75-seat dining room will offer an à la carte menu of seasonal California fare. The 25-seat, Duello, will have both classic and craft cocktails alongside food offerings. Largey also plans to offer a 6-seat tasting menu counter a few times a week within the kitchen, with seating against her workstation where she will prepare the food and converse with guests throughout the meal. Through this unique and cultivated experience, Largey intends to “break all the rules and create and approachable, unique collaboration with guests.” While committed to SIMONE’s culinary development and evolution, she pays equal attention to the restaurant’s staff, who will benefit from a supportive and respectful environment that fosters creativity and innovation while promoting a healthy work-life balance.